The registration fee is $16.50 for the first person and $15 for each additional person. Registration is completed by the unit leadership. Step 1: RSVP for the camporee by February roundtable with estimated numbers so the event staff can plan the event. Step 2: The troop leader pays online with credit card, electronic check or PayPal. Council refund policy. The ranch is located north of Chappell Hill close to the intersection of FM 1155 and FM 2193. The name of the ranch is Pleasant Home Farm. The ranch is owned by Mr. Jack Webb, former Scoutmaster of Troop 55, and his wife, Diane Webb. The camporee site will be open at 6:00 pm on Friday. BSA Health and Medical form for every participant. A paper copy of the BSA Health and Medical Record (Parts A&B) for every participant (Scouts and adults) is required to be turned in at registration. You can bring your alphabetized notebook which will be returned on Sunday morning. Troop roster will need to be turned in at check-in. Patrol roster will need to be turned in at the Friday night leader's meeting. 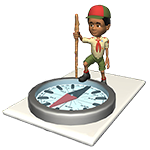 After check-in, campsite assignments will be given and a staff guide will lead the troop to the assigned campsite. There will be a mandatory meeting for Scoutmasters and senior patrol leaders at 10:00 pm on Friday evening. Following that meeting, the senior patrol leader must submit a roster for each patrol that will compete in the events. The Dutch oven competition is open to both Scouts and Scouters. Cook your best/favorite dish and share a small amount with the judges. The remainder of your dish may be shared with your unit. Suggested categories are appetizers, breads, soups, main course, meat, vegetables and desserts. Dishes should be submitted to the judge's station with the registration form under the dish (face down), so the judges do not know who cooked the dish. Access to the area will be directed by the event staff. After drivers have dropped off equipment and Scouts, the vehicles are to be parked in the designated parking areas. Remember that all staff -- adult and youth -- are volunteers. They have complete authority, in any matter in which a dispute arises. If anyone does not follow the direction or instructions of a staff member -- adult or youth -- that person or their entire unit may be subject to sanctions by the event committee. The parking rules will be strictly enforced. Only certain staff vehicles will be allowed to drive within the camporee area and these vehicles will be tagged so that all will know which vehicles that they are. All Scouts, Venturers, Sea Scouts and Scouters are encouraged to wear their Scout uniform. The field uniform should be worn at the morning and evening flag ceremonies, Sunday morning interfaith worship service and at the Sunday awards/closing ceremony. The field uniform or activity uniform can be worn at all other times. Each unit is encouraged to have its own first aid supplies and to handle scrapes and bruises in their unit. Each unit is encouraged to carry consent to treat forms for all persons in their unit. Emergencies and incidents that the unit cannot handle should be reported to a staff member immediately if you need assistance, and they will call the first aid staff to the area. A first aid station, with qualified staff, will be on site for emergencies and incidents that the unit cannot handle on its own. The first aid station will be located in the headquarters area. The first aid station will be available on a 24-hour basis. Please remember that this is a volunteer staff and consideration should be taken when having to wake them in the middle of the night. In the event that someone must be transported to the hospital (non-ambulance cases), it is the responsibility of the unit leaders to provide that transportation. Quiet hours will be enforced beginning at 11:00 pm until 6:00 am the next morning on both Friday and Saturday nights. Respect fellow participants by observing these quiet hours. Unit fires are expected to be allowed, absent any local fire bans. Proper procedures and precautions must be taken at all times. Fires must be raised off the ground and must be in some sort of fireproof container. Do not leave fires unattended…. Make sure it is out before leaving your area. Practice fire safety and have fire buckets and shovels at the fire area. Those who do not follow proper procedures will be asked to extinguish the fire and will not be allowed to have a fire for the remainder of the camporee. Firewood is not available on site. Bring your own supply of firewood, if you plan to have a fire. A spirit of Scouting and brotherhood must prevail during the entire camporee if it is to be a success. Conduct is to be in accordance with the Scout Oath, Scout Law, and the Outdoor Code. Scouters are responsible for the supervision of their units at all times and will be held accountable for their behavior. This is a good time for youth leaders to practice leadership skills. All Scouts are to remain at the camporee area at all time. Should it become necessary for a Scout to leave the camporee, the Scoutmaster must notify the staff at headquarters so that the Scout can be signed-out. Remember to ask permission before entering another unit's campsite. There will be no raiding, ambushing, or sabotaging another unit or unit site. Remember a Scout is courteous and obedient. The Scout Law teaches, "A Scout is reverent. A Scout is reverent toward God. He is faithful in his religious duties. He respects the beliefs of others.” It is important that Scouts be taught to recognize the beliefs of other Scouts and to respect those beliefs. There will be an interfaith worship service on Sunday morning. All Scouts and Scouters should plan on attending this service. Field uniform should be worn. There will be a collection for the World Scouting Fund. Each unit is responsible for supplying all of their own equipment. Each patrol should have their own equipment and camping area within the troop area. Each patrol competing in events will need the materials in this list. These items are not allowed for camporee and should be left at home. Use of, or possession of, any of these things will result in immediate dismissal from camporee and may result in a call to law enforcement agents. Fireworks are not allowed in the camporee area except as an approved part of the camporee program. Sheath knives and knives with large blades (over 3”) are not permitted. Larger knives that are used for food preparation are allowed but should be left in the patrol cooking area and put away when not in use. The buddy system is to be used at all times. Low impact camping should be adhered to and Leave No Trace methods should be used. Each unit is responsible for its own camping area, unit equipment, and meals. Each unit is responsible for its own trash/garbage. Please bring an adequate supply of trash bags. All trash/garbage must be removed from the campsite and placed in the dumpster departing camp on Sunday. Following the campfire, a traditional OA call-out ceremony will take place to recognize those youth and adults from the district elected into the Order of the Arrow. Scoutmasters should encourage elected candidates to attend camporee to be called out. Many troops choose to let the candidates be surprised when their names are called. Once each year, a troop may hold a unit election to elect youth members of their troop to become members of the Order of the Arrow. A special call-out ceremony is being held during the camporee for candidates elected into the Order of the Arrow by their troop last fall. Scouts are not required to participate in a call-out ceremony but must complete an Ordeal within one year, in order to become a member of Colonneh Lodge. If a candidate does not attend an Ordeal within one-year, then the candidate has to be re-elected by their unit. Instilling values in young people and preparing them to make moral and ethical choices throughout their lifetime is the mission of the Boy Scouts of America. Leave No Trace helps reinforce that mission, and reminds us to respect the rights of other users of the outdoors as well as future generations. Appreciation for our natural environment and a knowledge of the interrelationships of nature bolster our respect and reverence toward the environment and nature. Leave No Trace is an awareness and an attitude rather than a set of rules. It applies in your backyard or local park as much as in the backcountry. We should all practice Leave No Trace in our thinking and actions–wherever we go. The principles of Leave No Trace might seem unimportant until you consider the combined effects of millions of outdoor visitors. One poorly located campsite or campfire may have little significance, but thousands of such instances seriously degrade the outdoor experience for all. Leaving no trace is everyone’s responsibility. All participants are asked to follow the seven principles of Leave No Trace. Notice! Please be advised that promotional videotaping/photography may be in progress at any time at an event. Your entrance constitutes your agreement that the Boy Scouts of America has the right to reproduce your likeness in videography/photography for promotion (e.g., publications, internet, newspaper). 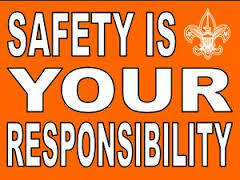 Safety is the responsibility of everyone. Weather is unpredictable. Bring rain gear. The event will be held rain or shine unless there is dangerous weather conditions. It is likely to be windy. Dress for the weather pack for the season. For those adults who smoke, please be careful of your ashes. Make sure that your smoking material has been properly extinguished and that the remains are deposited in a trash bag, not on the ground. Do not smoke in front of Scouts. Be courteous to others. For questions, contact linda.le503@gmail.com or the district activities chair.